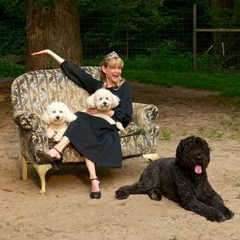 As a designer and owner of the Pooch Palace, my goal was to create a place where dogs would love to come and people would feel good about leaving their four-legged family members. That meant a place full of light, rooms for dogs with windows to look out of and a big back yard–with grass and trees–to run in, in the company of other dogs. I’ve been caring for animals as far back as I can remember, and since 2004 I’ve had the pleasure of getting to know hundreds of dogs and their caretakers. Everyone is unique and has something to teach us. My days are spent in the present-tenseness of dogs, and their love of a good day’s play and a clean, comfortable resting place is what it’s all about.